One of my favorite childhood books was The Chocolate Touch. It is a parody of King Midas’ touch. You know, that greek mythology of the king who turned anything he touched into gold. In the book, John, the main character, ate a special piece of chocolate and from then on, turned everything he came into contact with, into chocolate. I know what you’re thinking, 1) what an awesome power to have and 2) where can I get said piece of chocolate. I was thinking the same thing. I regret to tell you that the story is fiction (shocking I know). Spoiler: at the end of book, we learn that the ability to turn everything into chocolate is not such a good power. If you love chocolate as much as I do, I think you’re really going to enjoy what I have in store for you today. It was high time I baked a cake, a chocolate cake. I channeled my “chocolate touch” abilities and came up with a chocolate cake, with a chocolate ganache, covered in chocolate buttercream frosting. 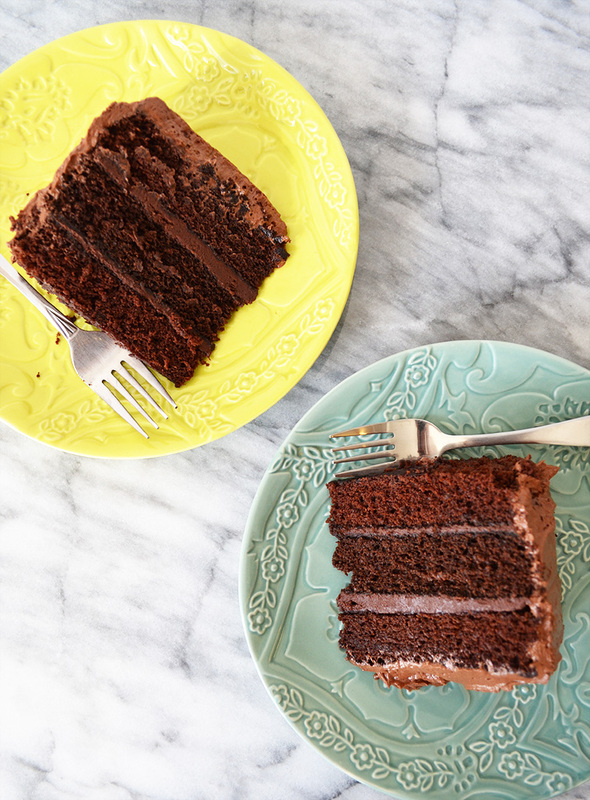 Needless to say, this cake is a chocolate lover’s dream. Tip: The ganache should be smooth enough to spread, but not too runny – think viscous volcano lava. I recommend making the ganache in advance and sticking it in the fridge overnight. Then let it sit out for 3-4 hours, allowing it to soften up. This cake is so deliciously dense and marvelously moist. 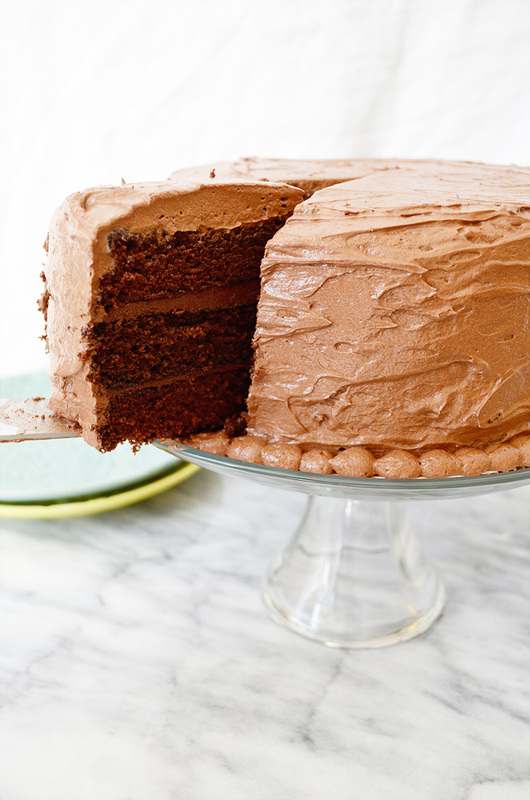 In other words, this cake is the best chocolate cake you’ll ever have. Grease (with butter) and flour 3 round 8'' cake pans, then line with parchment paper. In a large mixing bowl, mix together the butter, brown sugar, and white sugar with an electric mixer until fluffy. Mix in the vanilla and milk then add the eggs, one at a time. In a separate bowl, sift together the flour, salt, baking soda, and baking powder. In a small bowl, mix together the cocoa powder, boiling water, and instant coffee mix. Slowly mix in the flour mixture and cocoa mixture to the butter and sugar mixture. Evenly distribute the batter into the three cake pans. Bake the for 22-25 minutes. Allow it to cool completely before frosting. In a sauce pan, heat the heavy cream over medium heat. When the cream begins to simmer, stir in the chocolate morsels. Stir until all the chocolate is melted, about 4 minutes. Take it off the heat and allow it to cool for 4-5 hours. The ganache should be thick but spreadable. If it is too runny, chill in the refrigerator for 15 minutes. In a large mixing bowl, use an electric mixer to combine the butter and cocoa powder, one spoonful at a time. Mix until it is fluffy, about 3-4 minutes on high. Add the vanilla extract and instant coffee mix. Working in batches, slowly add the powdered sugar and milk - one cup and one spoonful at a time. Mix until the frosting is nice and fluffy. Set aside. Remove the parchment paper on the first layer of the cake and place it on a cake circle. Spread half of the ganache evenly on top of the first layer of the cake. Remove the parchment paper on the second layer of the cake, then stack it on top and spread the rest of the ganache evenly over the top. Remove parchment paper, then add the last layer. 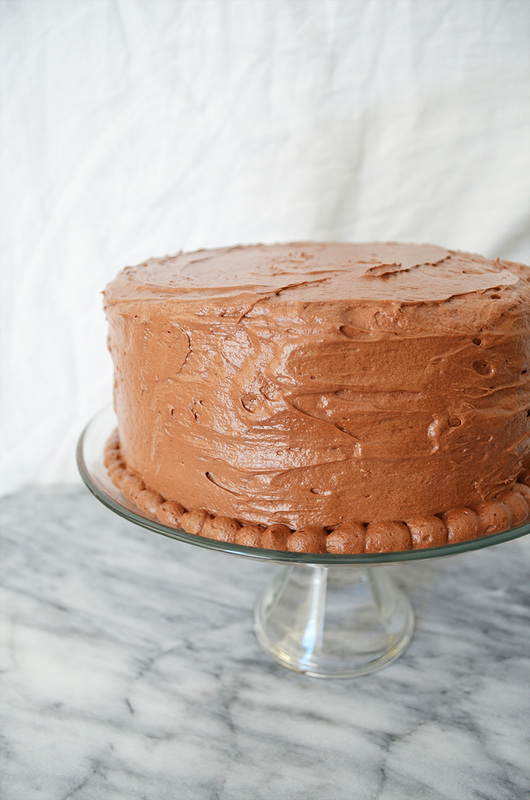 The ganache can be made in advance and chilled in the refrigerator. When you're ready to use it, let it sit out at room temperature to soften until it is spreadable, about 3-4 hours. This entry was posted in Desserts & Sweets and tagged cake, chocolate, ganache. Hi! Baked your cake and I’m waiting for it to cool to assemble! I’m so excited…it’s for my hubby’s birthday! BUT I have a question. There was no baking powder listed in the ingredients list, but it was mentioned in the directions. I added 1/2 teaspoon just to see what happened. I have a feeling I’ll be using this recipe again…do you know the amount baking powder used? If not, no worries. Thanks! Thank you so much for trying my recipe and for pointing out this error!! Happy birthday to your hubby! He is so lucky to have you!!!! Please let me know if you have any other questions, and also let me know how it all turns out!! Thank you so much for your quick response. And for the recipe…it was DELICIOUS! 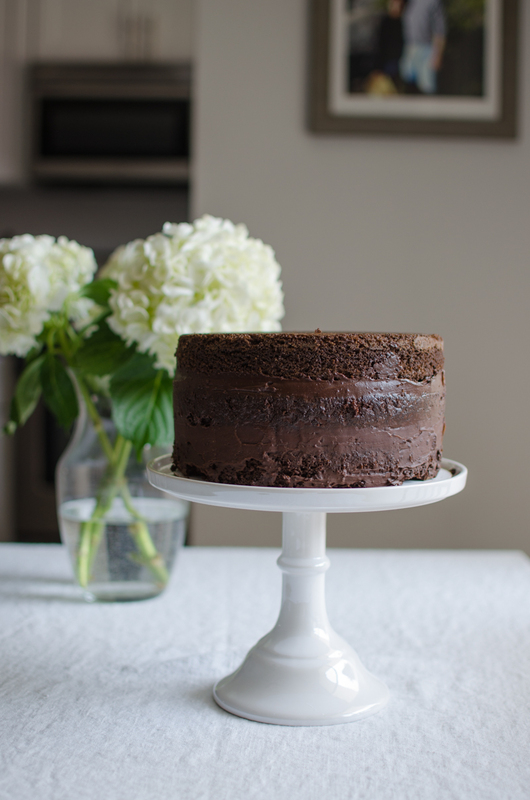 It was his favorite homemade chocolate cake yet…and I make one most years for his birthday!